Here in Nashville fall is well underway. The trees are changing colors and losing their leaves, the days are getting shorter, the mornings cooler, and a faint presence of winter is in the air. Fall is not only a great time to be outside, but it is also a great season to do some routine roof inspection and maintenance. As Nashville’s Top Rated® Local Roofer, we take great pride in providing the people of our city with superb roofing services. 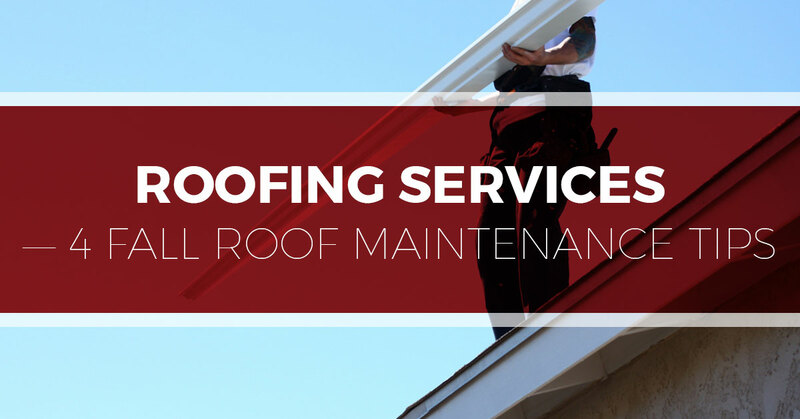 From commercial roof replacement to residential roof repair, we can handle almost all of your roofing needs. Contact us today for more information or for your speedy fast quote! Read on to learn about four roof maintenance tasks that you should add to your fall checklist. Gutters are an essential part of a home’s ability to drain water. They direct rainwater and melted snow and ice off the roof and into an appropriate drain. Typically, late in the autumn, gutters have accumulated a good deal of leaves, sticks, dirt, and debris and, therefore, need to be cleaned out. If all the debris is not removed, they can clog, causing overflowing, damage, and ice dams in the winter. Gutter Angle—proper sloping and positioning is essential to gutter functionality. They should be slightly sloped toward downspouts. This can be tested by simply spraying water from a hose into your gutters and observing the flow. If it flows the right way and doesn’t pool, your gutters are angled correctly. Distance from Home—if your gutters were at some point clogged or pooling water, they may have been weighed down and pulled from their fasteners, and, subsequently, causing them to be out of place. Holes and Leaks—by simply using a garden hose to fill the gutters with water, you can check for holes and leaks. Pay particularly close attention to the seams and don’t forget to inspect the downspouts as well. If you notice a leak or hole, they can more often than not be repaired using roofing cement or a form of silicone sealant. If you need help with these tasks or want the opinion of an experienced professional, contact Tim Leeper Roofing—we’d be glad to help! After enduring spring’s downpour, summer’s heat, and any big storms caused hurricanes going inland, your roof is likely due for a checkup. It’s best practice to perform this inspection in the fall—plus, fall weather is ideal for being outside, climbing up on your roof, and inspecting it carefully and thoroughly. You can start the inspection by looking for any loose shingles, cracks, blisters, tears, etc. It’s also important to examine the chimney and other areas where flashings are being used. Any problems that you spot should be remedied as soon as possible. For a more detailed explanation of what to look for when performing a roof inspection, check out this blog of ours. Remember roofing problems that go unrepaired are often magnified in the winter. Don’t wait until spring to fix any looming issues. As we’ve mentioned before, fall is also a great time to have your roof replaced. Contact your local roofing contractors today! If you have an attic, now is the time to take a peek inside. Sometimes residential roofs can appear fine from the outside but actually have an underlying leak that is damaging your interior. The attic—specifically the walls and ceilings that adjoin your roof—is the ideal place to check for any troublesome leaks. Signs of a leak might include discolored splotches, warped wood, mold, mildew, etc. These issues could also be the signs of poor attic ventilation or insulation. Any observed problems should be dealt with promptly, thwarting the progression of other larger problems. Trees can fall unexpectedly, creating costly and annoying damage. Sometimes this can be a single branch or the whole tree. Taking the time to inspect your trees and taking note of any potentially problematic branches or trees can save you in the long run. Trimming branches not only eliminates the possibility of them crashing onto your roof, necessitating a repair or a total roof replacement, but it also reduces the number of twigs, branches, leaves, and debris that fall onto your roof and clog up your gutters. Need Help with Your Roof Inspection or Repairing a Leaky Roof? Whether you need help installing new gutters, performing a roof inspection, repairing a leaky roof, or doing a complete roof replacement, Tim Leeper Roofing is here to help. We specialize in both residential and commercial roofing and have a team of experienced roofing contractors who take tremendous pride in what they do. Contact us today to get more information or for your free quote!